An interesting trip, showing some beautiful views of GIPPSLAND country through which “BUICKS” are running and daily adding fresh laurels to the “BUICK” reputation. No. 1 -A view of CARRAJUNG-Yarram Road. Car just commencing a very steep ascent; this view also gives one a splendid idea of the GIPPSLAND country. No. 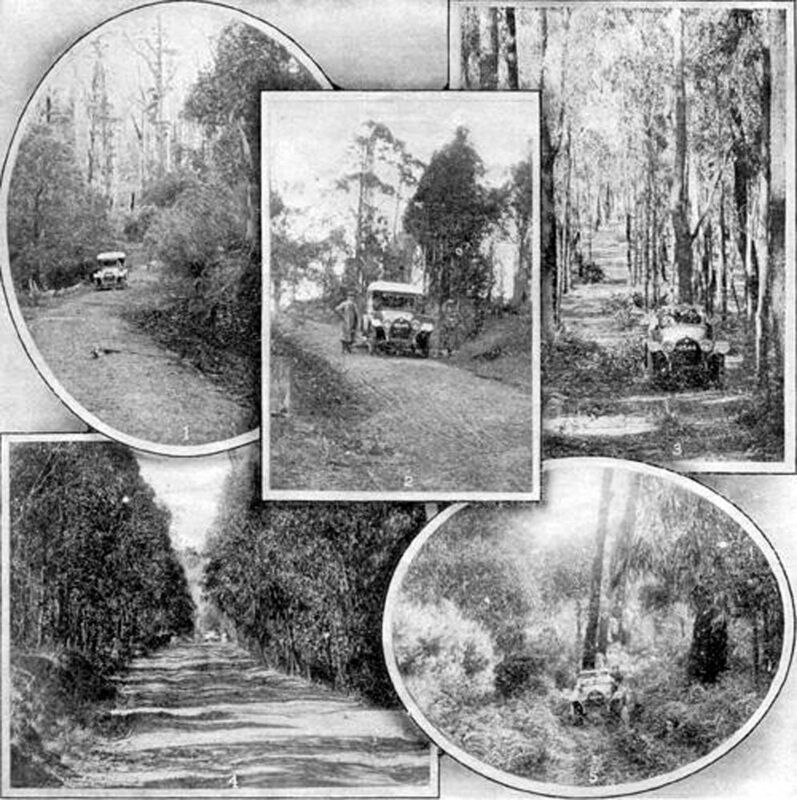 2 is on the Black-Warry Road, Yarram way, and gives an idea of the grades to be coped with by motorists particularly note the manner in which the car is “chocked” under the rear wheels, which, whilst in no way speaking detrimentally for the brakes, demonstrates very plainly the fact that the motorist considers it advisable to take no risks on such a grade. No. 3 is a continuation of the road shown in No. 5, and gives a further idea of the tracks over which “BUICKS” have to run in GIPPSLAND, and, moreover, brings very plainly to view the straight GIPPSLAND Timber so well known and often spoken of. No. 4 -View of the Walhalla Road, overlooking the flats of Traralgon district, where our agent, Mr. Dunbar, operates from. These views also give an idea of the hills in the locality. No. 5 depicts Gippsland road in the WALHALLA district, and (though it would seem almost an exaggeration, one which is practically only used by motorists, the road, you will note, is practically obliterated by ferns.